Is Sprint about to get a $20 billion deal from LightSquared? According to a story in Businessweek attributed to anonymous sources, LightSquared and Sprint are close to shaking hands on a 15 year contract that could pay Sprint as much as $20 billion. Both sides would share the costs of building out an LTE network that both companies would use. The end result would be that LightSquared could rollout faster than planned and Sprint-besides receiving the massive windfall-would have access to its partner's spare capacity which could save the nation's third largest carrier as much as $240 million annually. Last year, LightSquared agreed with FCC conditions that the carrier offer service to 100 million Americans by the end of 2012 and 260 million by 2016. Despite recent reports that LightSquared's LTE towers interfere with GPS signals up to 20 miles away, the company hopes to start service next year. A final report on the GPS problem is due at the FCC on June 15th and LightSquared says it does have a solution to the problem. Sprint has said that it would spend $5 billion over the next 3 to 5 years on technology that allows different spectrum bands on a single base station. For its part, LightSquared needs to add another $3 billion to the $1 billion it has in the bank, to completely fund its network. The alleged contract between the two would pay Sprint up to $2 billion a year from LightSquared in the beginning of the pact, to help pay for network equipment and construction costs. After that, Sprint will receive an annual payment based on the number of LightSquared's users on the network and their usage patterns. While the value of the proposed deal cannot be determined yet, Credit Suisse AG analyst Jonathan Chaplin says the deal is worth $1.2 billion in recurring revenue for Sprint. 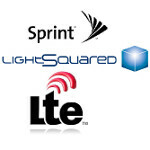 While LightSquared is also rumored to be in talks with AT&T about picking up some of the latter's spare LTE capacity, the former has already signed deals to provide high speed 4G service to Cricket, Best Buy, Cellular South and Open Range. Meanwhile, Audrey Schaefer and Bill White, speaking for LightSquared and Sprint respectively, both declined to comment on the speculated pact between the two firms. Hopefully by the time my next upgrade comes (2012) there will be certain information and stuff in motion to make Sprint LTE possible. It would be really premature to think they'll have LTE phones ready by then anyways. Anyways get this started Hesse! From what I've read, it sounds like the 4G radios that Sprint has been putting into phones (possibly even as far back as the EVO 4G) are firmware upgradeable to LTE. That would indicate a good deal of forethought on Sprint's part that would be very encouraging! Unfortunately it's only for their towers, not the phones. Their WiMAX towers are firmware upgradeable to LTE, might even be compatible with running side by side. We only have WiMAX radios in our 4G phones. Hey with this additional money Sprint will get, they can indeed set up a very competent LTE network very quickly. I am very satisfied how Sprint is attacking this LTE setup. I looks to be a very quick & profitable way to go with the LTE technology!